Hallowe’en is a festive time of the year when sweets and treats are in abundance and children are exposed to skyrocketing intakes of sugar. 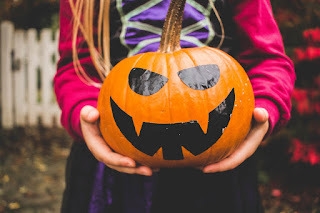 It can be a challenging time for parents that are caught between worrying about the health impact of junk food and wanting their children to enjoy the excitement of Hallowe’en. Below are some guidelines to help make Hallowe’en healthier for children. Support the immune system: sugar suppresses the immune system, making you more susceptible to colds, flu, infections and more. Incorporate immune support into your child’s daily routine such as herbs, homeopathics, vitamins, probiotics which will support the immune system. Talk to your naturopathic doctor about supplement and herb dosages that would be optimal for your child's age, activity level and general health. Limit candy access: avoid buying Hallowe’en candy until a few days before to reduce temptation to snack on candy that is lying around. Educate your child: help them understand that treats are for special occasions and to be enjoyed in moderation. Eat a wholesome meal prior to trick-or-treating: children will fill up on candy if they are hungry, spiking blood sugar levels and creating a vicious addictive loop to craving more sugar. Ensure your child eats a healthy dinner with protein, plenty of vegetables (including green veggies) and healthy fats such as olive or coconut oil. Avoid large portions of starches or sweet foods within the meals such as: rice, potatoes, noodles, yams, which spike blood sugar levels. Hydration: a glass of warm water or ginger tea can help your child stay hydrated and warm while they are out. Dress appropriately: make sure costumes don’t take precedence over dressing appropriately for the cold weather - ensure your child is wearing layers and that their throat, low back and abdomen are covered. Be a role model for your child: children will imitate the behaviour of those they see around them. Set a great example for your child by minimizing your own candy and sweet intake and encourage healthier options for the whole family. Choose healthy treat options: give out treats such as almonds, sesame snacks, goji berries, chia or applesauce packages, protein bars, organic agave sticks or chocolate covered fruit. Treats don’t always have to be sweet – you can give out stickers, colourful pens or pencils, squishy stress-balls, bottle of bubbles, mini-card decks etc. Party stores or dollar stores often have a great selection of affordable small toy items. You can check out the website Green Halloween for many treat ideas (food & non-food items): http://greenhalloween.org/content.php?page=treats Each year, more healthy and tasty treat options are becoming available. Check your local health food store for snack ideas. Sort treats according to health hierarchy: not all treats are equal. For example, potato chips are better than chocolate bars as they are lower in sugar and have a relatively lower blood sugar spike. However, some chocolate bars, especially dark chocolate may be better than hard candies which are often loaded with artificial colours, flavours and additives. It is always a good idea to sort your child’s candy from healthy to least healthy, and removing any foods that your child has a sensitivity towards (such as dairy or gluten). Involve your child in the sorting process, helping them understand why some treats are better than others. To avoid disappointment or resentment, try negotiating a trade for the candy – such as a toy, spending money or a special privilege. Set a timeline: The excitement of Hallowe’en for kids should not be hampered. However, it will naturally wane after a few days. After sorting through their candy, let your child eat what they want for three days, and then get rid of the extra candy. This is important since larger servings of junk food over a few days is far less damaging to your child’s health than a continuous stream of candy eating over weeks or months. Health concerns associated with increased intake of candy include: hyperactive behaviour, difficulty sleeping, reduced concentration, digestive symptoms, skin outbreaks and compromised immune function resulting in colds, coughs, or the flu. Ensure your child takes immune support (herbs, homeopathics, supplements) prior to Hallowe’en and the week after, or even longer if they are more susceptible to colds & flu. If you child is taking fish oil, double the dose temporarily to reduce restlessness, hyperactivity or sleep disturbances. If your child is on a multi-vitamin, double the dose for the following week to assist balancing the impact of food that is rich in calories and deficient in nutrients. Candy is better had after a meal or snack rather than on an empty stomach. This helps balance the sugar spike, and reduces the amount of candy intake in one sitting. Improving the pathways of elimination help support detoxification and the impact of junk food on the digestive system and other organ systems. Talk to your naturopathic doctor to see if any liver or digestive support is advisable for your child. Intensify your child’s oral hygiene regimen: regular brushing, flossing, and rinsing their mouth every time after they have candy. Your naturopathic doctor can advise natural toothpastes, mouthwashes and cleansing techniques for your child. Hallowe’en can be healthy AND fun ! A moderate amount of holiday indulgence paired with extra health measures helps everyone enjoy treats and long-term health. Remember, healthy habits start in childhood, so you are paving the way to healthy adults with these simple measures integrated into your child’s routine. Dr. Leena Athparia, is a naturopathic doctor at Naturopathic Foundations Health Clinic. She has a special interest in healthy eating and works with individuals one-on-one to address their health concerns. If you are interested in booking an appointment at our clinic, please contact 905-940-272. Oral Health: What is Oil Pulling?